Ironclad Coffee Roasters Launches Indiegogo Campaign for New Cafe | Food and Drink | Style Weekly - Richmond, VA local news, arts, and events. 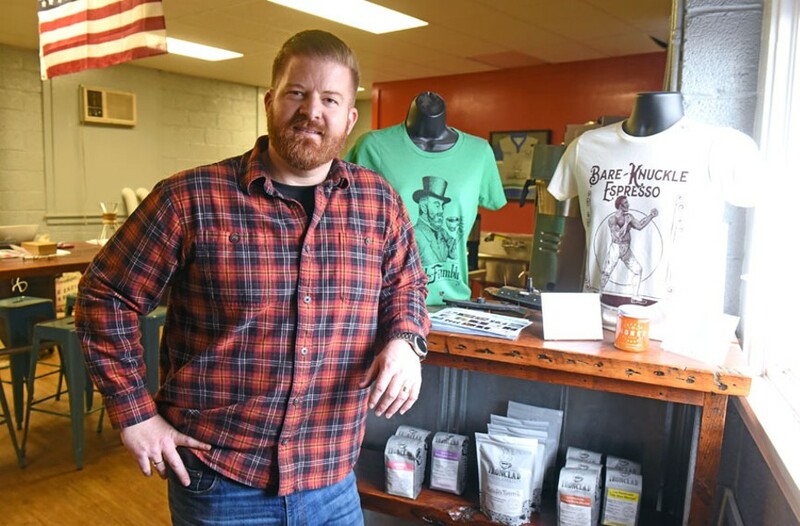 Scott Elmquist Ryan O’Rourke has had his sights set on a coffee bar since before launching Ironclad Coffee Roasters nearly two years ago. With the help of an Indiegogo campaign, he hopes to start pouring coffee and serving pastries this spring. Does free coffee for a year get you attention? The team behind Ironclad Coffee Roasters recently launched an Indiegogo campaign to raise funds for a coffee bar, and it's offering free coffee every day for a year to anyone who's willing to invest $250 in the endeavor. According to their calculations, if you're already a daily coffee drinker, that'll save you $376 over the course of the year. Ryan O'Rourke opened the roastery in 2016, and he's had his sights set on a cafe since day one. In addition to the coffee roasted in Scott's Addition, the menu will feature loose-leaf teas and kombucha, plus fresh pastries, muffins, bagels and cinnamon rolls from local bakeries. "We do not plan on offering a full food menu. Our philosophy is that nobody can truly be a jack-of-all-trades, so we're not even going to attempt that," he says. "The cafe will be clearly focused on the coffee, and we'll be working with these other talented folks who have honed their own respective crafts better than we could." O'Rourke notes that he's definitely the new kid on the block, and while he knows coffee, he's still got a fair amount to learn about the Richmond coffee scene and how his storefront will fit into it. "Coming in, we heard a lot of comments that the Richmond coffee scene was quite collaborative. What we've actually seen, though, has been a bit of a mixed bag," he says. "There is a measure of cordiality in some ways. Still, there is absolutely some territorial sentiment, as well. We've attended events hosted by our local competitors in an attempt to show camaraderie, but we also do not shy away from acknowledging that fair competition is a positive." The goal is for the cafe, located at 1805 E. Grace St., to open in May. In the meantime, you can find a link to the Indiegogo campaign at ironcladcoffee.com. The more casual coffee drinker will receive a bag of limited edition beans for a $15 donation, and anyone who gives $100 will get access to one of Ironclad's three Coffee 101 courses. Bordering on obsessed with all things coffee? Two lucky donors who give $2,500 will be invited to travel with O'Rourke and roaster Mike Jarrett to a coffee farm in Guatemala next year. Want to sample some coffee before committing to the campaign? You can find it at Urban Farmhouse, Union Market, Casa del Barco and Stir Crazy Cafe. Check out the Ironclad website for a list of wholesalers.